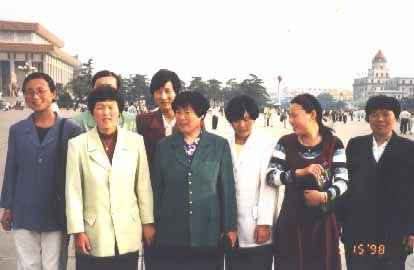 Pam the owner of Original Quilts traveled to China in May of 1998. She visited Shanghai, Guilin, Chengdu, Leshan, Xian, and Beijing. Here are some photos and memories from the trip. Be patient, this page takes some time to load because of the photos. In Shanghai, on our first day of travel, we were able to go into a school for children. This school is for after school activities. Each room had a different activity. 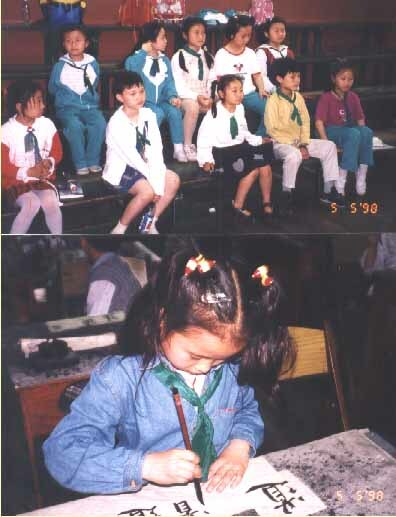 The top photo shows children singing, and the bottom photo shows a girl learning her Chinese letters. Other rooms had children dancing, playing musical instruments, and also acting class. On our second day of travel, we took a bus to Guilin. 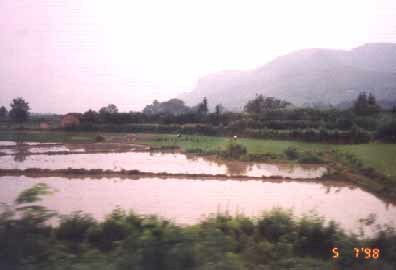 Here is a typical picture of the countryside, rice fields with the mountainous terrain in the background. 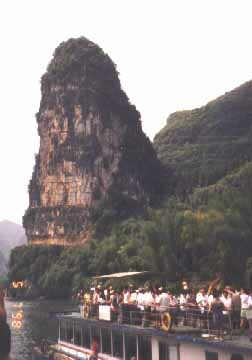 In Guilin we boarded a boat on the Li River and cruised about 50 miles (5 hours) to Yangshuo. The cruise offered mysterious peaks, green hills, and crystal clear waters. Next, we traveled to Chengdu. In most countries that I travel to, I like to see how people purchase their groceries. Our guide took us to an open air market where they purchase their food. 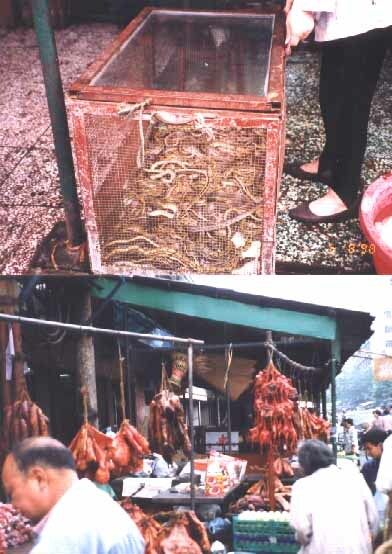 The photo above shows snakes in a bin, and the bottom picture shows a meat market. We also saw live chickens and water buffalo stomach. Chengdu is in the Szechwan area, where we tried "hot pot". It's a large pot of spicy soup, and we ordered meat to put in the pot to cook at the table, then ate. We ordered Bull Frog, Water Buffalo Stomach, and some other very interesting items on the menu. I enjoyed it all! Chengdu is also well known for their Panda Research Center. 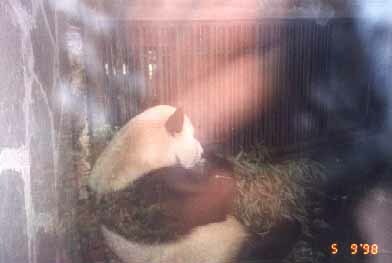 We visited the center and saw this panda eating. The photos are hard to take through the thick (dirty) glass. We also saw red pandas. 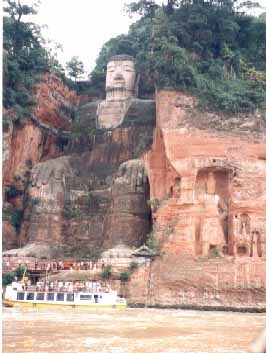 We traveled by bus through the countryside that is known as the Heart of China to the small city of Leshan, the home of the largest carved Buddha in the World. I took this photo from a boat out in the river. You can see the size when you look at the visitors viewing the Buddha from his feet. He's big! On our bus ride back to Chengdu, we stopped at the side of the road to see the rice fields. 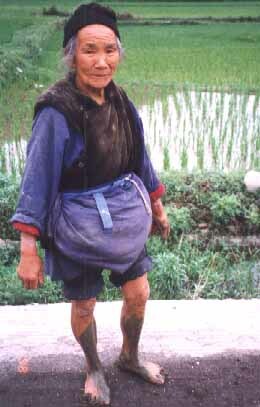 This woman had just come up from working in the rice fields. Our interpreter helped us communicate with her, she was in her 90's and still working hard in the fields. I can only dream of being that healthy! Yellow Creek Village is a classified as a National treasure by the Chinese government. 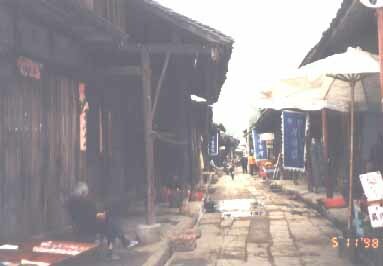 The buildings are not allowed to be changed as this village is an example of a typical Chinese village 150 years ago. Movies are sometimes made here. Next, we flew to Xian. 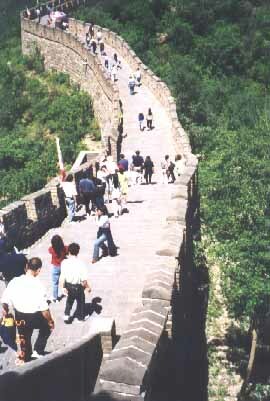 This picture is taken from the top of the wall in Xian down on the city streets. 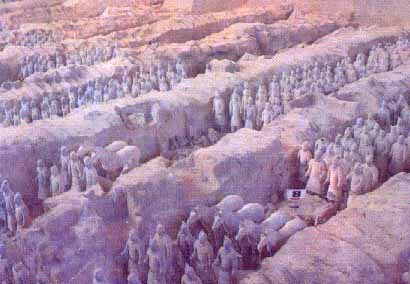 Xian is known for their terra cotta soldiers. Imagine large rooms the size of football fields filled with life size terra cotta figures. Some excavating was happening when we were there. It's mind boggling! We traveled to Beijing. This photo was taken at the Forbidden City. 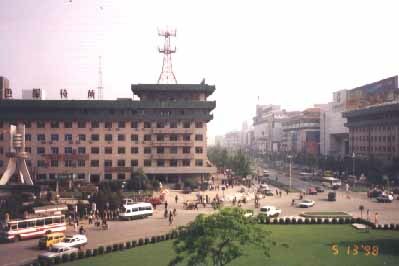 It's a highlight of central Beijing with over 10,000 rooms and several museums and fabulous buildings. 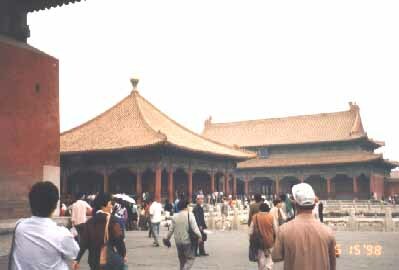 The Forbidden City is also the site of the movie The Last Emperor. 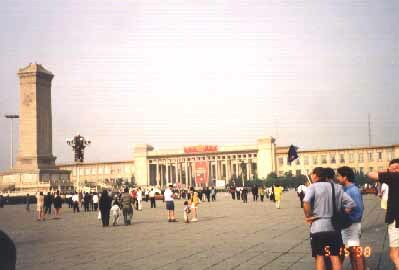 This picture is taken from the center of the famous Tiananmen Square, the largest Square in the world. 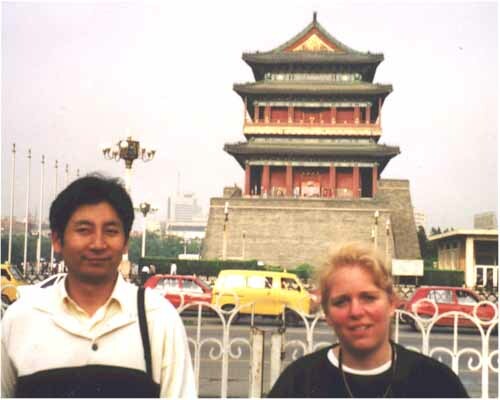 This is a photo taken in Tiananmen Square of our host and interpreter Wang Jie, and myself. This photo was also taken in Tiananmen Square. These woman all wanted my photo taken with them individually. Our interpreter said they had never seen a blonde woman -- (I'm blonde), so I was quite popular with lots of people staring at me. After all those pictures, I had to get a group shot of them! 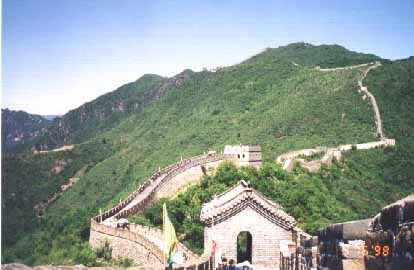 The Great Wall of China is great indeed! It is well worth the hike up a hill to the tram. Once up there, you'll never forget the feeling. Here's another picture of the wall. It's breathtaking! Don't miss it! We visited a cloisonné factory. 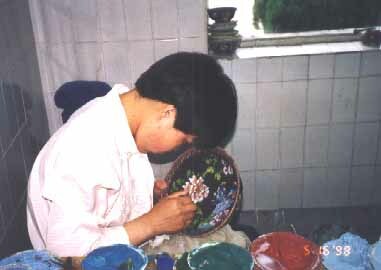 Here they are painting on the beautiful color onto the bowl.